"The Nightbird" redirects here. For the Monica Edwards novel, see The Nightbird (novel). 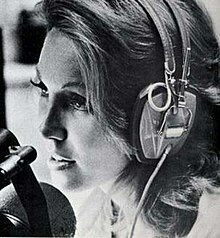 Alison Steele (born Ceil Loman; January 26, 1937 – September 27, 1995) was an American radio personality, writer, television producer, correspondent, and entrepreneur who was also known by her air name, The Nightbird. She was inducted into the Rock and Roll Hall of Fame. Steele was born Ceil Loman on January 26, 1937 in Brooklyn, New York. She had two sisters, Joyce and Emalie. In one interview, she had wished for a career in show business at three years of age. At 14, she landed a job running errands for a local television station, and opted not to study at university as she was "too impatient". She married orchestra leader and radio and television host Ted Steele who was 20 years her senior. The marriage ended in divorce. The couple had a daughter, Heather. In the 1950s, Steele had worked on her career to become a production assistant and associate producer for various New York City television and radio stations. Among them was Ted Steele's television show, The Ted Steele Show, on WOR-TV, where she hosted interviews and performed fitness routines that encouraged viewers to take part in. Ted was still married to his second wife Doris at the time. On July 4, 1966, Steele landed her first radio job when she became a part of the new line-up of disc jockeys for the newly launched rock station, WNEW. The station wished to only hire female air staff at first as part of its middle of the road format it marketed "sexpot radio", with Steele chosen as one of the final four selected out of the 800 women that applied. Steele worked the 2–7pm slot, Sunday through Friday. When WNEW abandoned the format after the eighteen-month trial to the increasingly popular progressive rock format, Steele was the only host that was asked to stay at the station. On January 1, 1968, WNEW placed Steele in the overnight "graveyard shift" which granted her more creative freedom, leading her to develop her on-air personality and rapport with her listeners. "I thought there must be a lot of people ... that need something to relate to in the middle of the night, and if I could create some kind of camaraderie, a relationship between myself and the rest of the night people, then it would be more than just music". She thought of a new air name, based on the gender ("bird" being slang for a girl) and her night owl hours of work, and chose The Nightbird. She then transitioned to recordings of some of the more exceptional and experimental music being recorded at the time, as well as featuring the best of the familiar favorites of her audience. As well as music, she recited texts and poetry over music. She would end her show with the Beatles' instrumental song "Flying", over which she would say her goodbye message: "Hello night bird. How was your day? Did you visit the gods in the valleys far away? What did you bring me, in your visit from the sea?" By 1971, Steele had acquired approximately 78,000 nightly listeners, the majority being men between 18 and 34. She was a supporter and promoter of the English rock bands Yes, Genesis, and the Moody Blues. By 1974, she had more than 100,000 listeners at any given average quarter hour of her show, and hosted a syndicated rock radio show to 600 stations nationwide, a radio show for women, and a cable television talk show. According to Jimi Hendrix's manager Michael Jeffery, the song "Night Bird Flying", recorded by Hendrix and released posthumously on the album The Cry of Love (1971), was inspired by Steele's show. Steele became known as "The Grande Dame of New York Night". Steele also did charity work and was a member of the board of the New York City chapter of the Epilepsy Foundation, worked for the Muscular Dystrophy Foundation, and was on the credit committee of the American Federation of Television and Radio Artists. At one point, she served as the station's music director. In 1976, Steele became the first woman to receive a Billboard Award for FM Personality of the Year, and the magazine also named an award in her honour, The Alison Steele Award for Lifetime Achievement, which was first awarded to Casey Kasem in 1997. After her departure from WNEW, Steele focused her career around television and writing. From 1982-84, she was the announcer for the daytime soap opera Search for Tomorrow, and was the producer, writer, and correspondent for Limelight on CNN. In 1984, Steele returned to radio on WNEW–AM which lasted until 1986. For a number of years, Steele was also the disc jockey for the pop/rock in-flight audio entertainment channel on board Trans World Airlines. Steele's final radio job was working overnights at WXRK from 1989-95. She also did some work for VH1, as well as running the cat boutique Just Cats with her sister in Manhattan. Steele did much voice-over work for radio and television commercials, and she provided the narration for one of Howard Stern's popular radio bits, "Larry Fine at Woodstock", featuring impressionist Billy West. In June 1995, Steele was forced to leave WXRK due to illness from stomach cancer. She died on September 27, 1995 at Lenox Hill Hospital in Manhattan, aged 58. She was survived by her daughter, sisters, and a grandchild. ^ a b "Alison Steele; Nighttime N.Y. Disc Jockey". The Los Angeles Times. October 7, 1995. Retrieved June 10, 2017. ^ a b c d e f g h i j k l m n o p q r s Sterling 2005, p. 363. ^ a b c d e f g Stout, David (1995-09-28). "Alison Steele, Disk Jockey, Dies; The Pioneer 'Nightbird' Was 58". The New York Times. Retrieved 2008-10-11. ^ "Talent Review – Ted Steele Show (TV)" (PDF). Billboard. August 7, 1954. p. 45. Retrieved June 10, 2017. ^ "The Girls Are Here". WNEWsletter. Vol. 2 no. 3. July 1966. ^ a b Boehlert, Eric (October 7, 1995). "Alison Steele, FM's 'Nightbird,' Dies". Billboard. Vol. 107 no. 40. p. 6. ISSN 0006-2510. Retrieved June 10, 2017. ^ "In the World of Radio, She's a Rare Bird". The New York Times. December 9, 1971. p. 60. Retrieved October 11, 2008. ^ a b Blumberg, K. Michael (February 17, 1974). "'Nightbird' of FM Accentuates Positive". Sunday News. Sterling, Christopher H. (2013). Biographical Encyclopedia of American Radio. Routledge. ISBN 978-1-136-99375-6.